Hi my name is Shock, I’m part of the Nightmare Crew. We are named after the Tim Burton movie “Nightmare Before Christmas” We live up to our names! At the end of the season last year we started training on the sled. On my second time out with Ms. Michele, she took a chance on me and put me in lead with Ringo ( a veteran of Team Ineka) I ran in lead for 6 miles and I had a blast! Shock is one of the main leaders of Team Ineka. 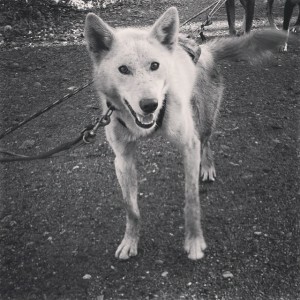 She is a veteran of two Junior Iditarods on Nicoles team. She is also the mom to the new pups in the kennel, the four brothers known as the WaG Crew. Hi my name is Burton, I’m part of the Nightmare Crew. We are named after the Tim Burton movie “Nightmare Before Christmas” We live up to our names! At the end of the season last year we started training on the sled. I have been running on the A Team since I was a pup. I like to run in wheel with my mom, Rasp and enjoy running fast in the dryland races too.